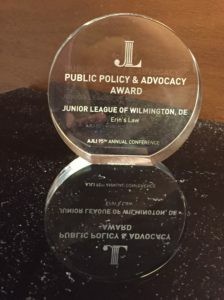 The Junior League of Wilmington has received a Public Policy & Advocacy Award for its instrumental role in the passage of a law to protect Delaware’s children. The Association of Junior Leagues International recognized the JLW for its work on Erin’s Law at its 95th Annual Conference in Minneapolis last Saturday. President Stephanie Graev and President-Elect Angela Gustavsen accepted the honor, which included a $5,000 award. Erin’s Law mandates age-appropriate sexual abuse education in publicly-funded schools. The JLW spearheaded efforts to have the bill introduced by Senator Margaret Rose Henry, herself a member of the Junior League, educated lawmakers on the bill and advocated for its passage, and celebrated the signing of the bill by Governor Jack Markell in August. Delaware was the 28th state to pass the law, named for advocate and childhood sexual abuse survivor Erin Merryn. There are 292 Junior Leagues across the United States, Canada, Mexico, and the United Kingdom that make up the AJLI.